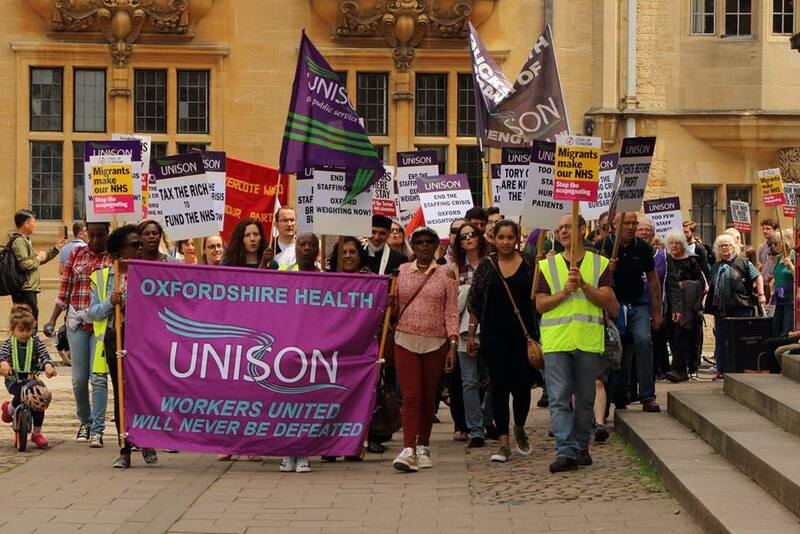 Oxford march for the NHS June 2018 to demand Oxford weighting, more NHS funds and an end to privatisation. Cuts increase risk to public in England and Wales Cuts increase risk to public in England and Wales UNISON report shows how austerity is damaging the environmental health service provided by councilsThe article Cuts increase risk to public in England and Wales first appeared on the UNISON National site. Building on the success of Grovember Building on the success of Grovember As we go for some spring growth in may, what does the data from Grovember tell us? What useful lessons can we pick out from it?The article Building on the success of Grovember first appeared on the UNISON National site. University employers improve offer at latest pay talks University employers improve offer at latest pay talks Offer still falls ‘far short’ of joint union pay claim, says head of education Jon RichardsThe article University employers improve offer at latest pay talks first appeared on the UNISON National site. Gas boss should have pay rise blocked, says UNISON Gas boss should have pay rise blocked, says UNISON Staff and investors should seize opportunity at Centrica AGMThe article Gas boss should have pay rise blocked, says UNISON first appeared on the UNISON National site. Saving the planet – and your pension Saving the planet – and your pension UNISON research shows that LGPS disinvestment from fossil fuels is still slowThe article Saving the planet – and your pension first appeared on the UNISON National site. Your voice, your vote Your voice, your vote It’s time to choose who speaks for you on UNISON’s national executive council. The election is open 15 April to 17 May 2019. The article Your voice, your vote first appeared on the UNISON National site. Local Service Champions Local Service Champions A huge network of people work together to keep our local communities going. Yet very few of us probably recognise the vital local services that we come into contact with everyday. It's time to give our local service champions the recognition they deserve.The article Local Service Champions first appeared on the UNISON National site. The accident must happen in the course of the member’s employment, or whilst travelling to or from work or upon Union business. £3.60 per day, £18.00 per week maximum during the whole period in which the member is unable to work by reason of the accident up to a maximum of 30 days or £108.00 in any calendar year. will be the rule book benefit with the highest monetary value. The fatal accident must happen in the course of the member’s employment, or whilst travelling to or from work or upon Union business and the member must be survived by a partner, or at least one dependant.